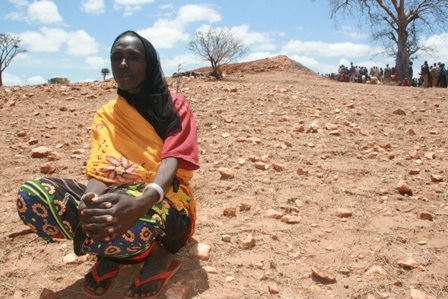 The food crisis in East Africa hit the headlines over the summer. Resources were mobilised around the world to support communities in need as drought in Kenya, Ethiopia and Somalia put millions of people in peril. Val Morgan of SCIAF (Caritas Scotland) reports from southern Ethiopia that although the news attention may have moved on, the suffering remains. What it is like to be hungry and facing a slow death by starvation? What it is like to see our family’s assets disappear, our children lose weight and our spouse join us in worrying how bad the future might just get? In early October 2011, I was brought a bit closer to these realities when I visited southern Ethiopia. The situation is truly desperate. People are going hungry, cattle are dying in large numbers, water sources and grazing land have all but disappeared, and the people don’t know whether they have a future. It has not rained in many parts of the Borena zone of Oromia region in southern Ethiopia since March 2010. Around 4.5 million people are in need of emergency food aid, and a quarter of a million livestock have already died. Last week I met many people in need of food aid. I saw for myself the decaying carcasses of cattle, many just left by the side of the road. The loss of livestock is a major issue in Ethiopia. The vast majority of the Ethiopian population, 85 per cent, live in rural areas. In the southern regions many are animal herders. For generations they have lived a semi-nomadic life, rearing cows, sheep, goats and camels, living on food generated from the animals such as milk, cheese and meat. Their livestock are their only assets. In Ethiopia a person’s wealth is not measured by the car they drive or house they live in but by the number and health of their animals. Breeding and selling offspring have for thousands of years provided the equity needed by families to buy grain, clothes, medicine and–where such institutions exist– school fees. On an emotional level the cattle also form part of the family. They are loved and cared for, they are part of the herder’s identity and history. It brings great shame on these people to lose even one animal, never mind a whole herd. This is the tragic backdrop to the current drought affecting southern Ethiopia. Not only are people hungry and increasingly desperate, they are also facing the end of their traditional way of life. Many people told me there is no Plan B. When the cattle go, we are next. Others who had already lost their cattle said, quite hopelessly, it doesn’t matter if the rains come now, we have lost everything. It is deeply worrying that over the coming months, and in the absence of any meaningful rainfall, hundreds of thousands of more people will move towards total dependency on humanitarian aid, or they will die. The next substantial rainy season was due to start in September but there has been only light and infrequent showers. Future forecasts are not looking good. Last week I visited a range of emergency aid projects being managed by SCIAF, its sister agencies CAFOD and Trocaire (Caritas members from the British Isles) and its partners in the area. The projects are a vital lifeline to people and include direct food and cash distribution, cash-for-work initiatives for the able-bodied so they can build up stronger community resilience through clearing grazing land of unproductive bushes, deepening ponds to capture more rain whenever it falls and renovating wells to improve access for people and their cattle. There are also emergency feeding stations to help keep cattle alive and destocking programmes in which we are buying cattle that are unlikely to survive, providing vital cash to families, and the meat is given to those most in need. As I travelled through village after village I could see that our work was making a difference, but I could also see that the need is far greater than we are able to provide for. More or less the whole population in the south is moving towards a state of abject poverty. The truth is we in the wealthy nations of the world usually only see the end game, the point where there are enough emaciated babies to justify sending television cameras to cover the unfurling horror. But away from the refugee camps and global attention the next wave of hungry people is moving slowly towards a situation where they will tip over into a state of total dependence on humanitarian aid or quietly die in their homes. Many will no doubt move and cluster in areas where they can get support. I met many people who had already walked for days searching for water. When they are thin enough, when the fatality figures rise, the world’s attention will once again catch up with the people caught up in East Africa’s drought. In the meantime they are just waiting, praying, seeking a cup of grain from traders, begging for credit from a neighbour, selling their skeletal cattle if they can, and most of all, praying for the rains to come. Aid is being put to good use. The people I met are extremely relieved to be receiving such help and many said they would already be dead if it had not arrived. The type of aid being given is also vital. In addition to keeping people alive today through emergency food and cash distribution, the work of SCIAF, its partners, and many other agencies is focusing on building up future communities’ resilience by improving access to water resources such as ponds and wells, and clearing more grazing land. There is also a strong focus on helping herders diversify their incomes. I visited one local co-operative which had started to produce soap for local markets. Much more work, and on a far larger scale needs to be done urgently by NGOs and the wider international community if we are ever to move into a position were the poorest people in our world are able to support themselves, especially through difficult times such as these. In the course of our emergency response to disasters such as the current drought it is crucial that we focus on future sustainability and help vulnerable communities to become more resilient. This longer term perspective may seem less media-friendly and the cameras may still focus on the ‘end game’, but it is only when poor communities are helped to work their way out of poverty and increase their asset base, local markets and infrastructure, that they will be strong enough to cope with future shocks such as widespread drought. It is only then that there will be any hope of rebuilding the livelihoods and human dignity of drought-affected people who are currently moving towards total dependence on humanitarian aid–and witnessing the loss of their world as they know it. Val Morgan is the Communications Officer for SCIAF (Caritas Scotland).